Custom Made Cubic Zirconia Jewelry Designs! When you want the finest custom made cubic zirconia jewelry designs, you must turn to Ziamond, The Cubic Zirconia Specialists. 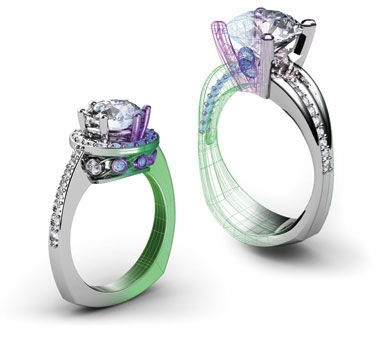 We are recognized as the finest in our industry and known as top quality Master Jewelers. Ziamond is commissioned by many customers to create the custom design of their dreams using the finest man made lab created and lab grown diamond simulant cubic zirconia stones, set in precious 14k gold, 18k gold or platinum. Ziamond can and will surpass your expectations with our abilities, as well as our quality for you custom made cubic zirconia jewelry designs. Simply fill out the form below and provide us with as much details and specifications as possible so we may grasp the full scope of your specially designed, custom made dream jewelry. A specialist from our special order production department will contact you to discuss your design in order to provide you with an accurate quote, as well as all your options. Since all Special Orders are custom made and exclusively made for each client, they are a final sale and are not returnable. Simply fill out and submit the form below and start your custom jewelry design journey.